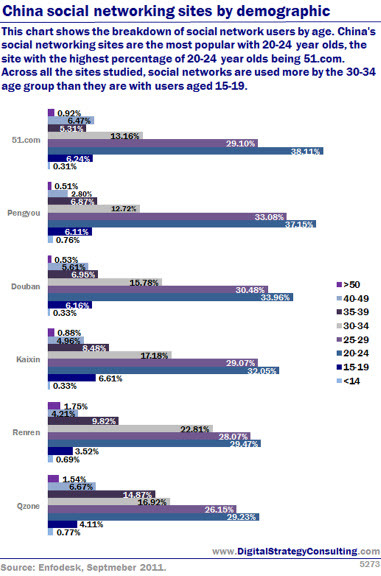 Entries from Digital Intelligence tagged with "kaixin"
This chart shows the breakdown of social network users by age. China's social networking sites are the most popular with 20-24 year olds, the site with the highest percentage of 20-24 year olds being 51.com. Across all the sites studied, social networks are used more by the 30-34 year age group than they are with users aged 15-19. For the international marketer, China represents one of the largest digital audiences in the world. With over 550m now online, 400m connecting via mobile, and over 300m on social media in China, the digital audience is growing fast. This article looks at six key social networks in China.